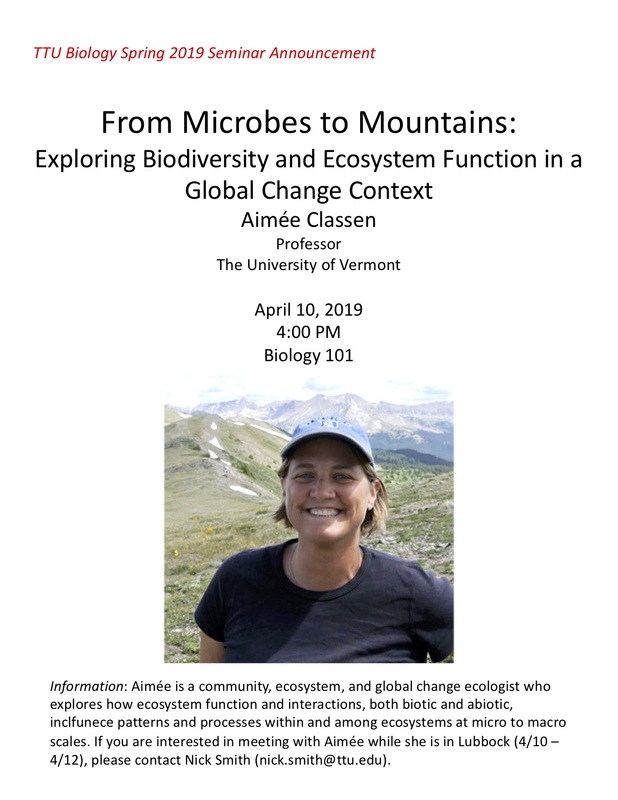 This week the lab hosted Aimée Classen for the weekly Department of Biological Sciences Seminar. It's amazing how having a great scientist in your midst can stimulate new ideas and even make you question some of your older ones. Thanks Aimée for a fun visit! April 8, 2019: Evan receives a NSF GRFP Honorable Mention! Evan received an honorable mention for his NSF GRFP proposal to examine the role of microbial symbionts in influencing biosphere-atmosphere feedbacks in a future world. While not a full fellowship, an honorable mention is a great achievement. The award recognizes all the hard work Evan has done developing a strong proposal for his graduate studies and his potential as a scientist to make a difference in the world. 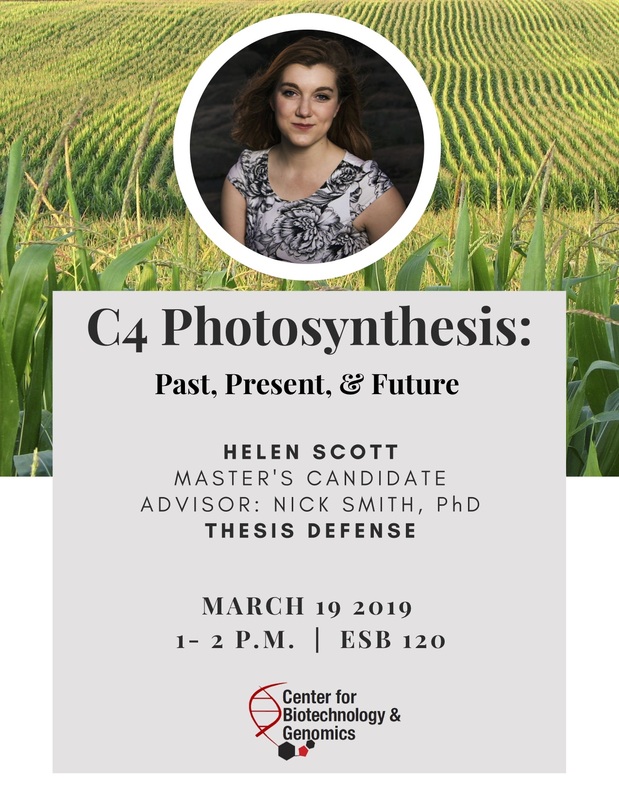 March 19, 2019: Helen passes her Masters defense! Helen successfully defended her Masters thesis on modeling C4 acclimation. In her thesis, she was able develop and test a theoretical model for C4 photosynthetic acclimation, including acclimation of stomatal and biochemical processes. This was quite an accomplishment for such a short-term project. Look forward to the forthcoming publication and for all the cool new science Helen will be doing at her next stop! February 17, 2019: Helen Presents a poster at the AAAS Meeting in D.C.! Helen attended the American Association for the Advancement of Science (AAAS) annual meeting in Washignton D.C. this week. She presented a poster over her thesis work in the Environment and Ecology session. 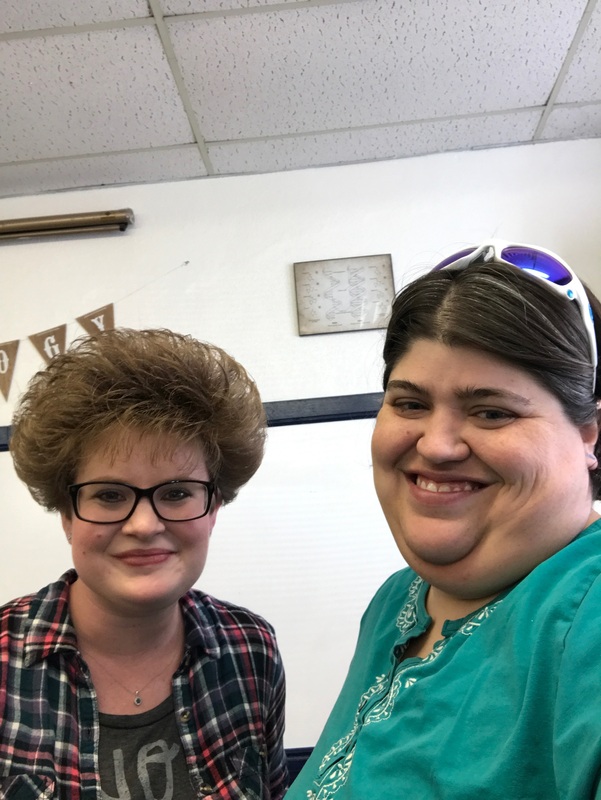 February 13, 2019: Lizz and Risa Return from CTSM and Fort Hays State University! 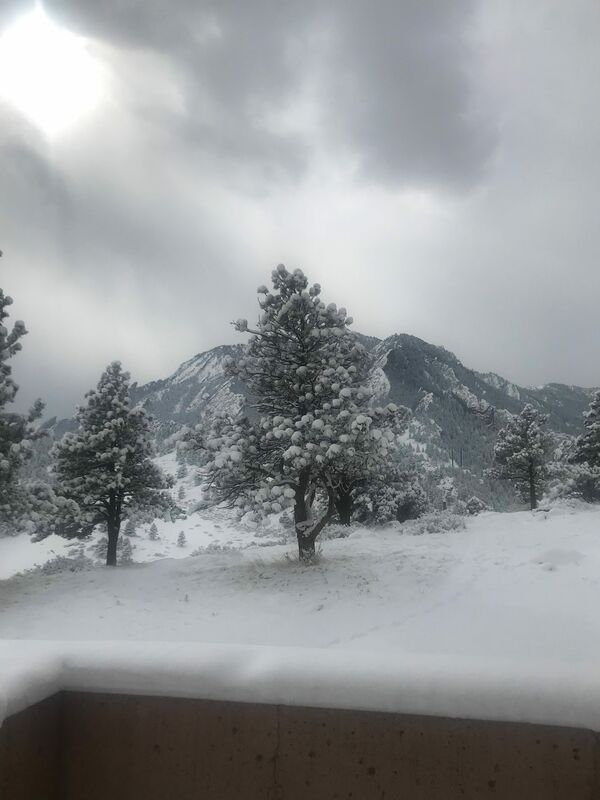 After a 1200 mile (1930 km) round trip,Lizz and Risa are back from their week at NCAR! Much was learned about the CTSM and FATES models. Progress was made on current project, ideas were formed for new projects. And there was lots of snow! 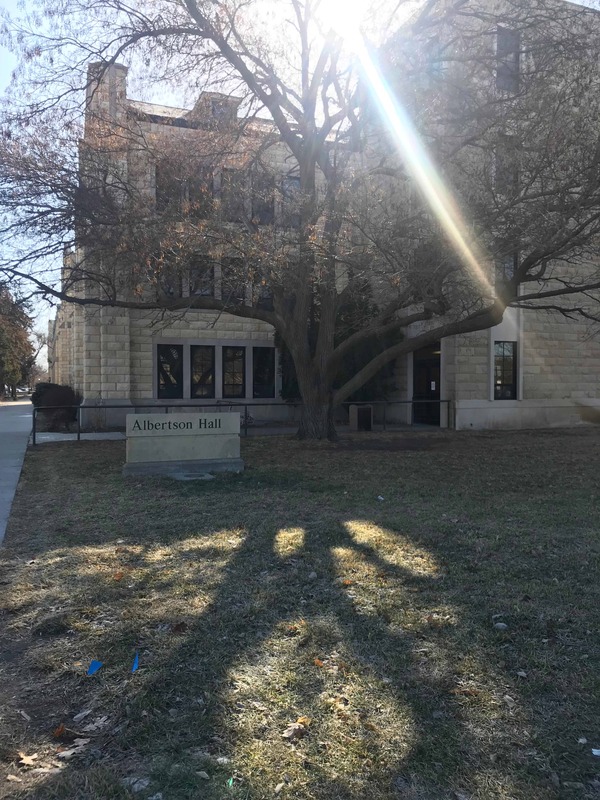 After the tutorial, Lizz traveled to Fort Hays State University in Hays, KS to give a seminar on Carbon assimilation and Nitrogen Fertilization Accross Scales. It was great for Lizz to be back where she did her masters and meet the newest generation of Fort Hays Tigers. After her seminar, Lizz gave a lecture on how to be successful when starting college to Keri Maricle's AP Biology class at Thomas More Prep High School. Keri and Lizz are old lab mates and it was great talking with the students. February 4, 2019: Lizz and Risa learn CTSM! 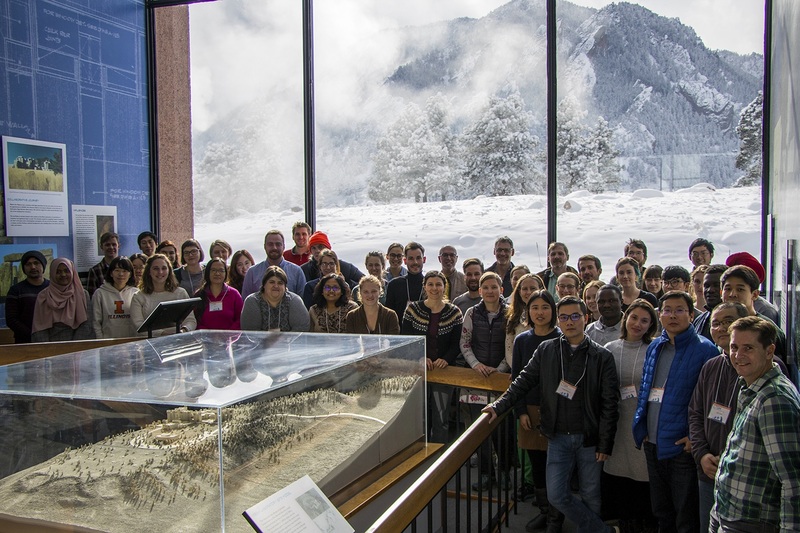 Lizz and Risa have begun a week-long tutorial to learn how to simulate global terrestrial ecosystem processes using the Community Terrestrial Systems Model (CTSM). 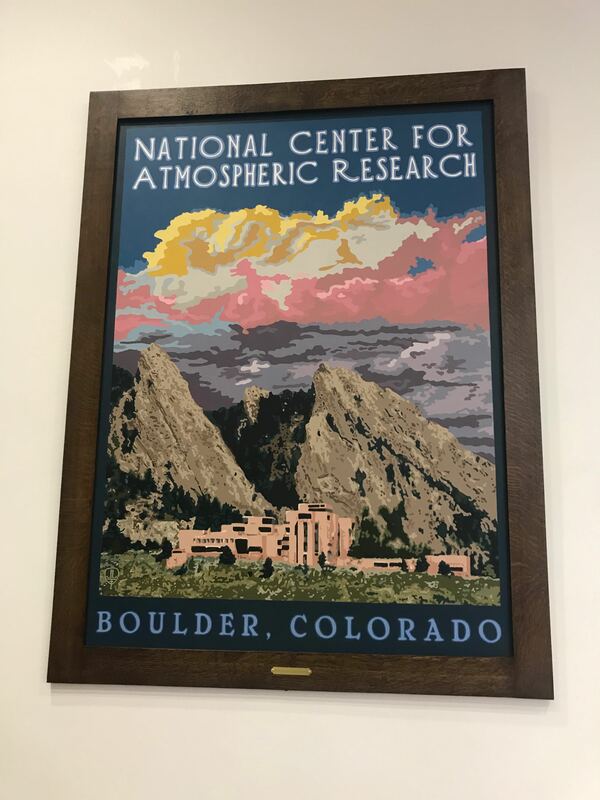 The tutorial will take place at the National Center for Atmospheric Research in Boulder, CO. There is an amazing list of speakers. The rest of the lab is excited to hear what they learn! Lizz is hoping to use the CTSM to explore the impact of nitrogen on plant physiological processes across large spatial and temporal scales. She plans to use her experimental work to provide model improvements. Risa is interested in simulating the impact of different cover crop species on biosphere-atmosphere feedbacks. She is interested in how these feedbacks change with species as well as moisture availability. More information on the tutorial can be found here: http://www.cgd.ucar.edu/events/2019/ctsm/. As an aside, the Smith Lab is actively working on porting the CTSM to our local HPCC, so that lab members and folks across the TTU campus can run global experiments. Stay tuned! Today is the first day of the Spring semester. 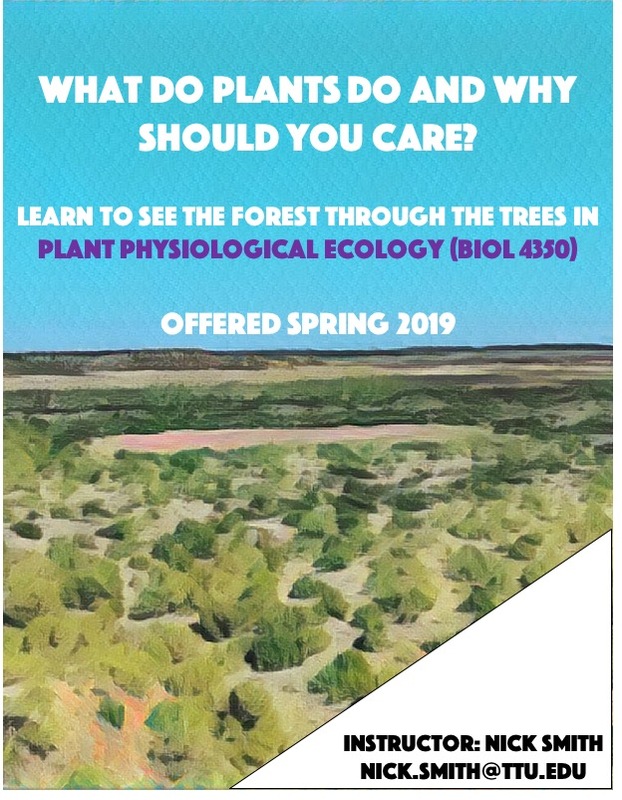 This semester Nick will be teaching Physiological Plant Ecology, an upper-level course for advanced undergraduates and graduate students. The course will cover a mix of foundational research in the field as well as some more recent trends. If you are interested in learning more, please don't hesitate to contact Nick or check out the course GitHub repo where all the course material will be posted. January 4, 2019: NEW LAB PUBLICATION! Nick led a study to examine the drivers of leaf-level photosynthesis, specifically the maximum rate of Rubisco carboxylation, commonly termed Vcmax. This rate is important for determining how much carbon plants take up via photosynthesis. However, Vcmax is known to be quite plastic over space and time, making it difficult to predict at large spatial and temporal scales. The authors further developed a theory for predicting optimal rates Vcmax, with optimization meaning maintenance of maximum carbon uptake at the lowest cost. The theory was driven by climate and light availability alone. When tested against a global observational dataset of Vcmax, the theory did quite well, explaining >60% of the variation in the observations. 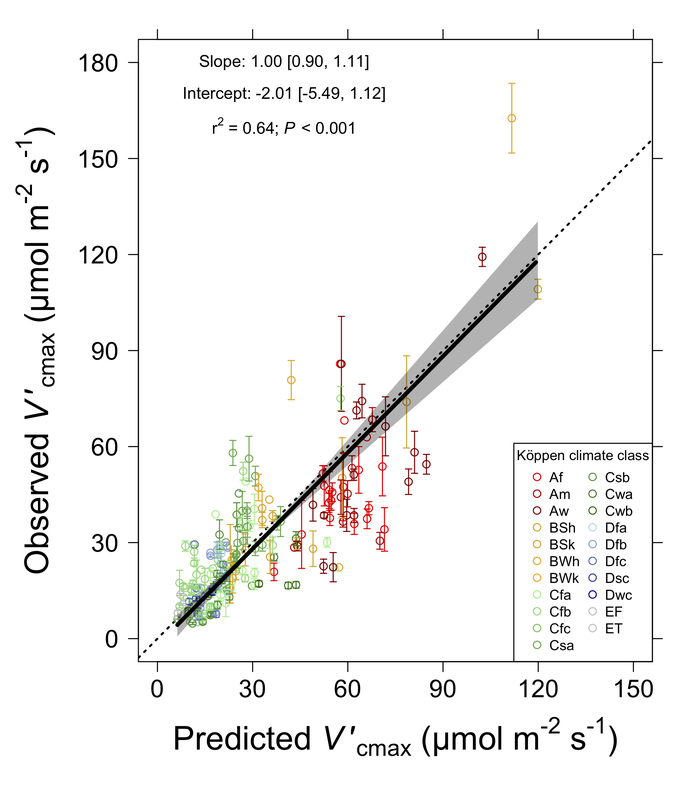 The results suggest that light available and biophysical constraints due to climate determine large scale patterns of Vcmax. The results also suggested that soil fertility was not a major driver of Vcmax at these scales, an effect that contrasts with theory implemented in Earth System Models (ESMs). The theory is a much simpler representation of acclimation than that is currently used in ESMs, thus providing a way to simplify these complex models, improving the reliability of their future predictions. The study was published online in Ecology Letters. Smith, NG, TF Keenan, IC Prentice, H Wang, IJ Wright, Ü Niinemets, et al. (2019). Global photosynthetic capacity is optimized to the environment. Ecology Letters. doi: 10.1111/ele.13210. Comparison of Vcmax as predicted by optimization and observed in a global dataset. Data are colored by the Koppen climate class of the site where the data were taken. January 1, 2019: It was big year for the lab! Field sites were established, experiments were done, and papers were published. The lab added many new members and saw others move on to bigger and better things. Check out all the previous year's new in the 2018 Archive. On to a fun, productive, science-filled 2019! 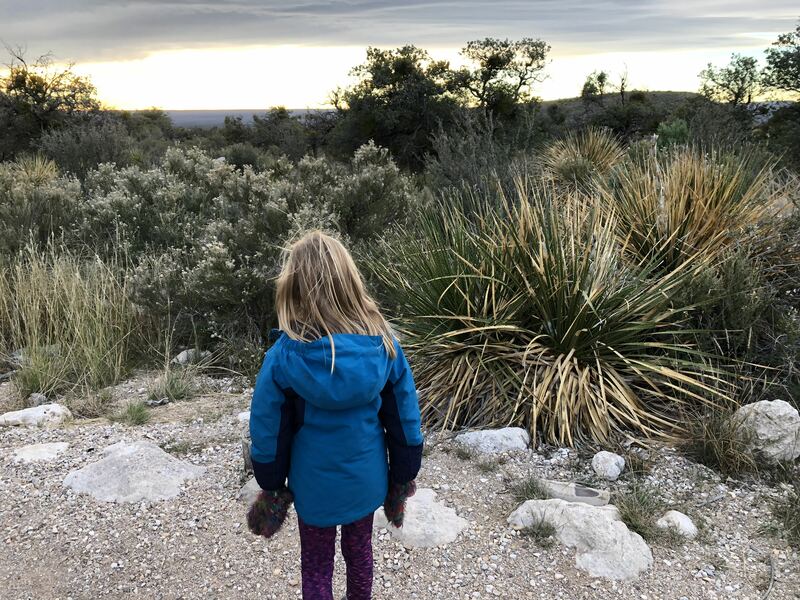 Youngest lab member, Marlo Smith, stares down a Guadalupe Mountain sunrise.